Justice Retired Amir Hani Muslim, Chairman of Supreme Court-mandated Commission on Water and Sanitation of Sindh said that water is life which essentially means that we must divert our attention and develop strategies and action plans to solve water-related issues, this he said in the closing ceremony of Diploma Course in “Flood Forecasting and Flood Hazard Management” held at U.S.-Pakistan Center for Advanced Studies in Water (USPCAS-W), Mehran University of Engineering and Technology (MUET), Jamshoro on Saturday. The Chairman said that The country has witnessed devastating floods, prolonged drought, heat waves, and erratic weather patterns which affect almost every aspect of life including agricultural productivity, livestock, food security, emergence of new diseases, changes in disease vectors, recession of the Himalayan glaciers, hydropower generation, etc. He said that the Indus River System is the lifeline of Pakistan economy and water availability in Pakistan has decreased over time. Currently, per capita availability of water in Pakistan is down to almost 1000 cubic meters from more than 5,000 cubic meters in 1947 and the country is at the verge of becoming a water-stressed country. “The situation is aggravated further due to the fact that Pakistan is considered as one of the most vulnerable countries in the world to climate change”, he added. He further said that the water security has emerged as an impediment to sustainable development in Pakistan and inefficient management of water leads to losses greater than 50%, reliable drinking water is accessible to less than 15% of the population, and inadequate sanitation contributes to preventable waterborne diseases and associated environmental and health issue. On the concluding note, he appreciated the efforts taken by the MUET Water Center serving as a nucleus and a laboratory to facilitate adoption of necessary measures in translation of water Sustainable Development Goal (SDG). He suggested with collaborative efforts through this Center the policy measures and action plans could be identified which could help to address the Water Sustainable Development Goal (SDG-6) as per Pakistan’s commitment to the United Nations. 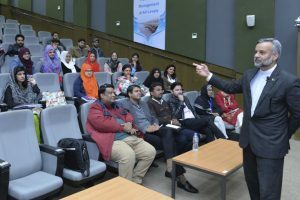 On this occasion, MUET Vice Chancellor Dr. Mohammad Aslam Uqaili said that learning is lifelong process and through the process the knowledge can be transferred, applied, created and integrated. Dr. Uqaili said that prevailing water situation and climate change condition place us in the state of high responsibility to prepare ourselves and all those concerned in effective management of our water resources and also equip ourselves in dealing with extreme weather events. 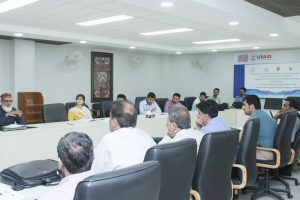 He further said that the Diploma Course which focused on a very important need of the region – “Flood Forecasting and Flood Hazard Management” was actually a fine example of not only recognition of the potential of the MUET Water Center in meeting the challenges of water sector but it is also an example of joint and coordinated efforts of the Center and the Sindh Irrigation Department. 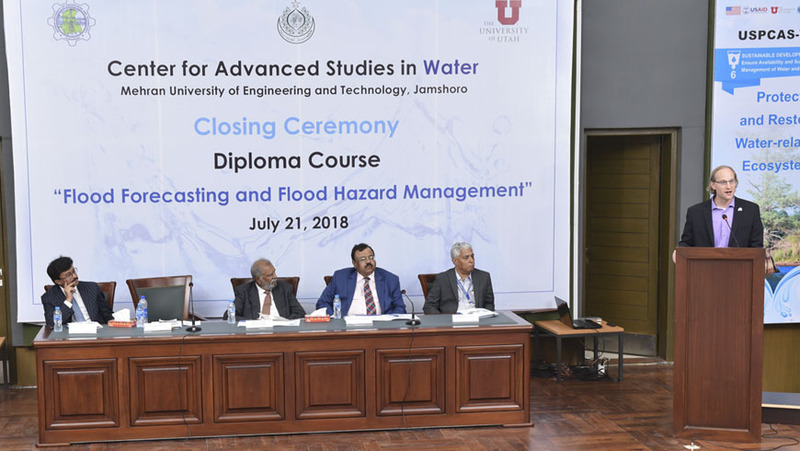 Speaking in the ceremony, Secretary Irrigation Jamal Mustafa Syed said that this diploma course has enhanced the capacity of the officers of the department and now they will apply the knowledge in the field with their acquired skills and expertise. He further said that two more diploma or short course certification training courses will be soon started for the officials of the irrigation department with the collaboration of MUET Water Center. He appreciated the efforts of trainers and management of USPCAS-W MUET for the successful completion of the diploma course. On the occasion, Dr. Steve Burain, Director USPCAS-W University of Utah, Prof. Dr. Bakhshal Khan Lashari, Project Director USPCAS-W MUET, Prof. Dr. Rasool Bux Mahar, Deputy Director USPCAS-W MUET spoke on the occasion. In technical session the diploma participants include groups lead by Engr. Zarif Iqbal Khero, Project Director Chotiari Reservoir Circle, Engr. Mansoor Ahmed Memon, Project Director LBOD and Engr. Habib Ursani, Deputy Director Technical of Irrigation Department gave presentations on their different projects on which they will apply the knowledge, skills, and expertise acquired from the diploma course. The diploma course is a collaborative effort of USPCAS-W MUET and Sindh Irrigation Department, Government of Sindh after signing of the Memorandum of Understanding (MoU) between the two entities. 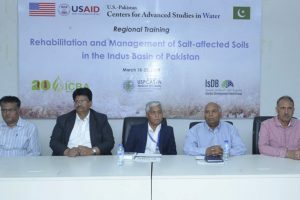 It included funding support of Rs.41 million for “Capacity Building of Officers/ Officials of Sindh Irrigation Department.” Total 12 participants who are professional engineers in the Irrigation Department, Government of Sindh completed the diploma course which included seven training modules and 16 credit hours that was designed by the experts of USPCAS-W MUET and the University of Utah, USA. Prof. Dr. Sajjad Ahmad, University Nevada, Las Vegas USA, Dr. Steve Burain, University of Utah, Dr. Arjumand Zaidi, Dr. Kamran Ansari, Mr. Waqas Ahmed and Mr. Babar Naeem and others from SUPARCO were training resources persons of the Course. In the ceremony, Syed Mazhar Ali Shah, Member Sindh Indus River System Authority (IRSA), Dr. Mohammad Aslam Chaudhry, Chief of Party USPCAS-W University Utah, former Secretary Irrigation Khalid Hyder Memon, Project Coordinator Water Sector Improvement Project (WSIP) Dr. Fateh Mari, Chief Engineers, MUET Deans, University of Utah Faculty, USPCAS-W Faculty, Civil Society Activists attended the ceremony.